Electrostatic self-assembled carbon nanotube/nano-carbon black fillers with grape bunch structure are added into cementitious composites to develop multi-functional/smart materials. The mechanical, electrically conductive, and self-sensing behaviors of electrostatic self-assembled fillers-engineered cementitious composites are investigated. The feasibility of using self-sensing electrostatic self-assembled fillers-engineered cementitious composites for in-situ monitoring of concrete columns is also verified. 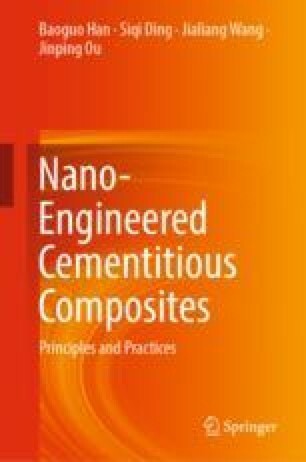 Experimental results show that because of their good dispersibility and cooperative modification effect, the electrostatic self-assembled fillers can effectively enhance electrical conductivity of the cementitious composites and endow stable and sensitive self-sensing capability to the cementitious composites at a low content of fillers. The electrostatic self-assembled fillers-engineered cementitious composites with self-sensing capability present potential for structural health monitoring of smart infrastructures.